Since the weather in southern Ontario has kept well below zero degrees these last couple of weeks, I’ve been spending a lot more time indoors. My usual weekend running routine has gone by the wayside in favour of indoor HIIT workouts, if only to avoid the frigid temperatures beyond my front door. Don’t get me wrong though. I usually love bundling up for a run on a cold winter day—I don’t get overheated and the feeling of a long, hot shower afterwards can’t be beat—but on days that are -15°C with a windchill? No thanks. By the time I’m finished working out, showering and then pulling on my comfies, I’m usually starving and ready to get dinner started, and that means hunkering down with winter comfort foods like hearty chili, creamy casseroles, and warming soups and stews. 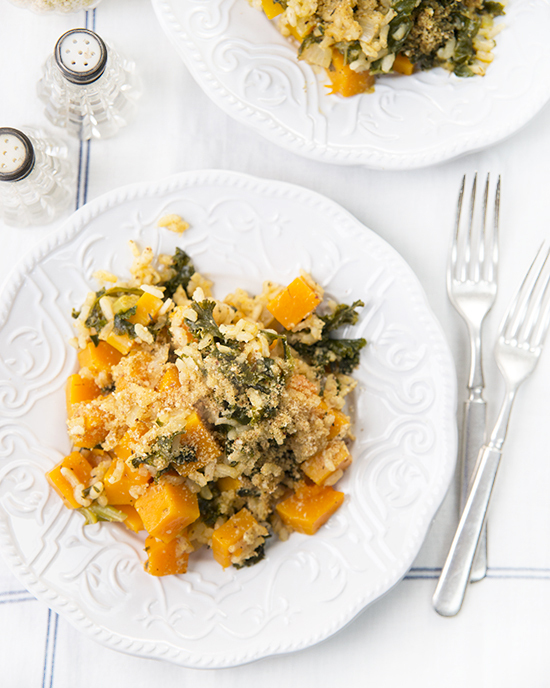 Or this quick and easy butternut squash and kale risotto with cheesy almond parmesan. Yes, please. If you’re looking for something warm and cozy for dinner tonight, look no further. This creamy vegan risotto dish is full of flavour and can be on the table in less than an hour. Topped with almond parmesan, it’s one of the most satisfying meals I’ve made in a while. When most people think of risotto, they often think of cheese and butter and the laborious stove-top stirring, requiring up to an hour to achieve that perfect consistency. Dairy is by no means necessary for a creamy risotto, and this simpler, more hands-off baked version is proof. 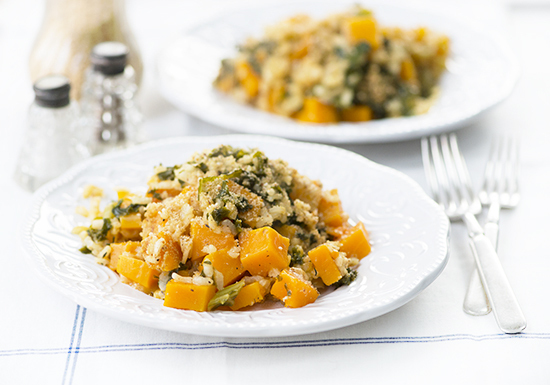 The result consists of soft, tender grains of Arborio rice that become thick and creamy when baked with the cubes of butternut squash and chopped kale. Traditional chefs and Italians around the world would likely turn their nose up at the fact that I made this dish without wine (and cheese! and butter!). If you’re keen, feel free to sub the 1/2 cup vegetable broth in Step 6 for a dry white wine. It may be an unorthodox way to prepare such a traditional dish, but it works. You have to do some cooking before putting the dish in the oven, but then you’re free to prep the almond parmesan topping, make a salad and set the table while it bakes. This dish is truly winter comfort food. Enjoy! Peel the butternut squash and cut into small cubes. Set aside. Wash the kale and remove tough stems. Chop into small strips and set aside. In a large oven-proof pot or dutch oven with a tight-fitting lid, heat the olive oil over medium-high heat. Add the onion and garlic and cook, stirring occasionally, until soft, about 5 minutes. Stir in the thyme and black pepper and cook until fragrant, about 30 seconds. Add rice and ½ cup of broth and cook, stirring frequently, until liquid is absorbed, about 3 minutes. Add remaining broth and the prepared squash. Bring to a boil. Remove from heat and stir in the prepared kale. Cover, transfer to the oven, and bake until rice and squash are tender and most of the liquid is absorbed, about 20 to 25 minutes. 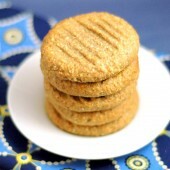 Remove from oven, sprinkle with almond parmesan and serve! Place all ingredients in a spice grinder or dry blender and pulse until powdered. What a beautifully nutritious dinner. I love butternut squash and have 2 waiting on my table for just such a recipe right now so, thank you! I’m sure those flavors work so deliciously with the almond parm too. I’ll add a tad more black pepper and boy will I munch down this one. Thank you, Angela! I’m a big fan of butternut squash and wish I had 2 more waiting on my table, too. :) Enjoy the recipe! Ooh, this looks delicious! 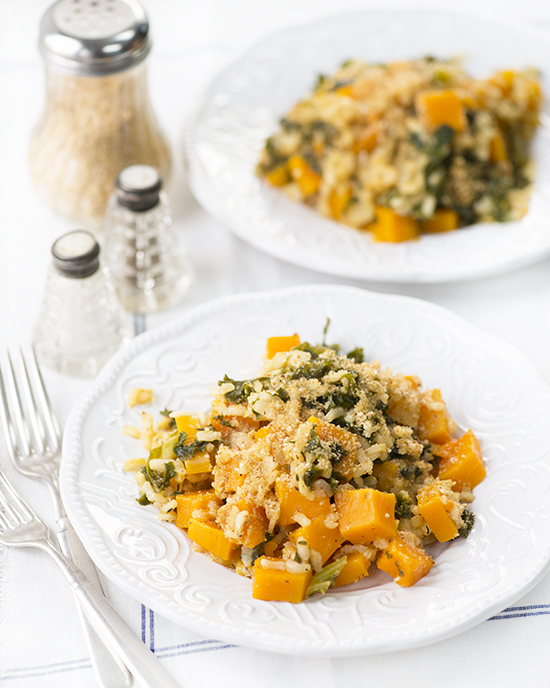 Some of my favorite things (squash, kale, and risotto) all in one dish! Perfect for the cold winter weather we’ve been having lately. Thanks so much, Meredith! Wonderful to know you love this combination of ingredients. Enjoy! This looks ridiculously good! Question thought – what is Arborio rice and where could I find it? Do you think regular white rice would work? Arborio rice is a special kind of Italian short-grain rice that gets nice and creamy when it’s cooked. It should be pretty easy to find in the rice section of your local grocery store.